we have been working hard for the publication of this issue of «Cassirer Studies», which came out with a considerable delay last July 2018. Accordingly the volume bears a double numeration: it follows the previous issue (VI/2013), with no reference to the current year (VII-VIII/2014-2015). The title “An der Schwelle einer neuen geistigen Welt” quotes Cassirer’s words to say the passage from expression to representation and a new constellation of Ausdruck, in which that of Aby Warburg can be inscribed. Thanks to the contribution of the American Philosophical Association the section SEMINAR edited by Fabien Capeillères gathers the proceedings of the conference “On Cassirer and the Neo-Kantian Legacy”, held in St. Louis, Missouri, in February 2015. The section NACHLASS edited by Maurizio Ghelardi presents Aby Warburg’s text “Die Wanderungen der antiken Götterwelt vor ihrem Eintritt in die italienische Hochrenaissance”, from of a conference held in Göttingen in November 1913 which is in close relation both to the study “Italienische Kunst und internationale Astrologie im Palazzo Schifanoja zu Ferrara” (1913) and to the conference on the history of astrology held in Hamburg in August 1913 by Warburg, Franz Boll and Carl Bezold. We are thankful to our publisher Bibliopolis who made this publication possible and are happy to announce that the journal has become its property. of its actual achievements and its present fruitfulness regarding art and aesthetics. of the symbolic forms, allows us to conceive of in the world of culture. the notion of image, and perhaps more surprisingly, of the notion of measurement. methods, commonly considered as quantitative and calculative. formation with reference to Cassirer will be presented in the last step. I. MELAND, The Doctrine of Basis Phenomena. A Phenomenological Foundation for the Philosophy of Symbolic Forms? hermeneutics, which is a cultural hermeneutics of freedom. adumbrated in Benjamin’s critique of the symbolic. FABIEN CAPEILLÈRES, Art Critique as a Philosophical Science? This paper explores Panofsky’s and Cassirer’s theories of movies and painting as symbolic forms in comparison with Kracauer, Cavell, Della Volpe, Merleau-Ponty, Robbe-Grillet. In the first part, it argues that Panofsky’s theory gives a paradoxical sense to the «motion pictures», particularly discussed by Cavell. In part two, on the basis of Cassirer’s theory of transition from the expressive to the conceptual function of art, the paper examines the history of movies and painting in modern and postmodern times. It emphasizes the revival of a realistic and critical function of art in photography, movies and painting brought about after the skeptical postmodern period of conceptual art. In this short paper I investigate the following problem: How can there be a philosophical critique of the works of art in a transcendental perspective? It seems that we are confronted to a structural dilemma: either the “critique” is transcendental and it then addresses the forms of the work (its spatiality, temporality, etc.) but can neither analyse nor legitimate the claim of beauty, or it addresses this claim but then has to give up a transcendental analysis in favor of psychology, sociology, etc. I try to show that even if the transcendental analysis can neither explain nor legitimize the beauty of a given work of art, it offers a discipline that constitutes the only path to a possible legitimate feeling of beauty. This essay proposes a reading of Cassirer and Heidegger that aims to bring out a number of curious parallels in their language and similarities in the images they employ as a way of demonstrating a certain rapprochement between their works without, at the same time, losing sight of the very real differences between them. The paper is divided into three sections. The first two sections set out the basic lines of Cassirer’s and Heidegger’s thought in general, focusing on their respective accounts of language and art in particular. The objective in these sections is to provide prima facie evidence for the need to pursue a line of interpretation that goes beyond the framework of Davos. By way of conclusion, section three ventures some tentative suggestions for rethinking the belonging-together of Cassirer’s philosophy of culture and Heidegger’s thinking of being. Walter Benjamin’s concern with Ausdruck/Expression, as it unfolds in his essay on Goethe’s Elective Affinities, finds an echo in the development of Cassirer’s thought as the focus of it shifts from the Ausdrucksfunktion to the Ausdrucksphänomen in The Philosophy of Symbolic Forms, and, then, from these to a culturological conception of Ausdruckswahrnehmung and the originary phenomenon of Expression in his late works. It is precisely this originary acceptation of the phenomenon of Ausdruck that sheds light on the philosophical relationship between Cassirer and Benjamin. In the Orphic word Elpìs, as the ultimate originary phenomenon that Benjamin takes up from Goethe, is an anticipation of and perhaps a move beyond Cassirer’s account of Werk. Accordingly, the ideal transition from his Basisphänomene to the Logic is clarified, in that the irreducibility of the work as originary phenomenon alludes to das Ausdruckslose/the Expressionless, the critical power of the truth concealed in the work, and in the beauty of the work of art. It is this power that determines the symbolic world as semblance, and the works as torsos of truth, «plant-like» muteness and still life. This article interprets Expression (Expression-Ausdruck) as reverberation, a latent theme, the aura of representation (Darstellung). This originary ground (Urgrund) forms an inert and unconceptual core that has not yet differentiated into the originary phenomena (Urphänomena), being devoid of visibility. In this stratification Expression is represented as expressive phenomenon (Ausdrucksphänomen), as the relationship Ich-Du, irreducible to the relationship with the Es. Expression lacks objectuality, lacks work. The “transition to the Work” (Übergang zum Werk) and the tool (Werkzeug-vorhandenes Zeug) is introduced in the midst of the debate between Cassirer and Heidegger. Transition to the Work opens up the “sphere of things”, objectuality. The work conceptology models itself on the conceptology of Kunstkritik. This is the transition from Sinnkritik to Werkkritik. This paper examines the role of imagination, intuition and narrative in the work of Cassirer and Heidegger. In so doing it contests standard analyses that view Heidegger at the time of their Davos exchange to have denied objectivity and scientific rationality (and Cassirer to be exclusively defending both). To contest this view, I treat these thinkers’ significant relation to (and transformations of) Hermann Weyl’s philosophy of science and its emphasis on transcendental temporality. I further investigate the status of the narratives that support Heidegger and Cassirer’s ensuing accounts and their reinterpretations of phenomenology – both the classical (Husserlian) position and the phenomenologies of German Idealism (Hegel, Schelling). Finally, I focus upon the pivotal and dialectical implications of imagination with respect to the rational and the reciprocal relationships between science and art. The journal «Cassirer Studies» is glad to have joined the Internationale Ernst Cassirer-Gesellschaft (IECG). We would like to thank Christian Möckel and Birgit Recki for their support! 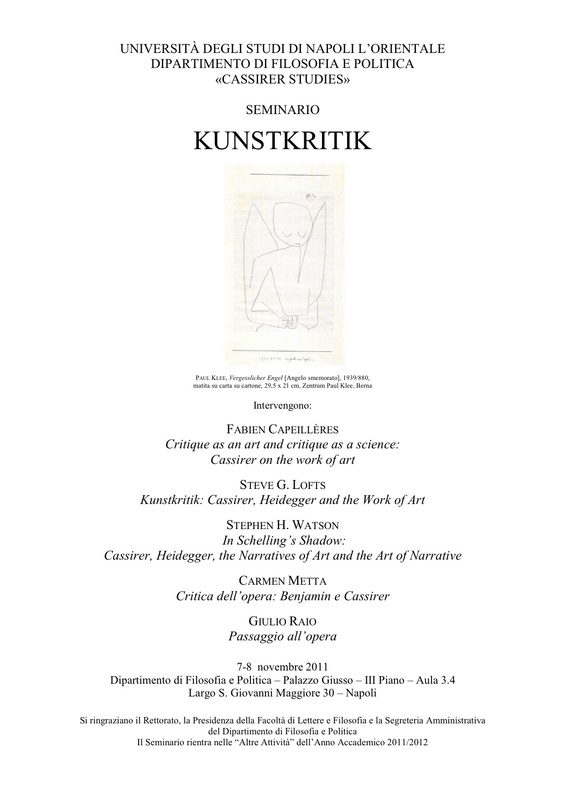 On 7 and 8 November, 2011, the University of Naples “L’Orientale” will host a conference on Ernst Cassirer. Participants will include Fabien Capeillères (Université de Caen), Steve G. Lofts (King’s University College at The University of Western Ontario) and Stephen Watson (University of Notre Dame, Indiana). The seminar will address boundary questions concerning the philosophy of symbolic forms and the artistic theories of the nineteenth century, from a historical-philosophical as well as aesthetical and theoretical perspective. The keyword “Kunstkritik” – in its meaningfulness and problematic translation as “art criticism” or “critique of art”, in its philosophical matrix – may provide a thread for our reflection. Born of an idea of John Michael Krois, the third volume of Cassirer Studies offers a thorough discussion of Cassirer’s “originary phenomena”, starting from the most famous of Cassirer’s posthumous works: On Basis Phenomena. Each contribution paves the way for a multifaceted Auseinandersetzung between the philosophy of symbolic forms and the contemporary philosophies of the origin and the fundament. In his theory of the basis phenomena in the fourth volume of the Philosophy of Symbolic Forms, Cassirer connects the third basis phenomenon – that of the work – to the ancient Socratic problem of self-knowledge. The self acquires knowledge of its own nature by apprehending the various symbolic forms of culture, which are made by the self. The self does not have a substantial nature apart from what it produces as human culture. The self knows itself through its distinctive cultural activity. It is, in fact, this activity itself. The meaning of this activity is to be found in the phenomenon of the work, which is the basis of culture. All forms of knowledge are the products of man as animal symbolicum. Thus all forms of knowledge are in fact forms of self-knowledge. Cassirer’s philosophy of self-knowledge is not achieved in a metaphysical system in which all symbolic forms are absorbed into a single logical order. Cassirer replaces the idea of philosophical system with that of “systematic overview”. This approach allows the self access to its own activity in terms of how symbols function in any given context without reducing the uniqueness of the various contexts to something more universal. This paper explores Cassirer’s theory of the Urphänomene as a theory of the symbolic expression of life and as an extension and development of his philosophy of symbolic forms in response to the contemporary movement of Lebensphilosophie in general and Heidegger in particular. The paper argues that the theory of the Urphänomene is connected to “the great process of Auseinandersetzung” that is undertaken by the symbolic forms. In part one, the philosophical issues at stake in this debate between Cassirer and Heidegger are set out in reference to the historical context of Cassirer’s engagement with Lebensphilosophie. In part two, we consider the meaning and function of Auseinandersetzung within Cassirer’s philosophy of symbolic forms. Finally, we turn to an examination of how this Auseinandersetzung is grounded by Cassirer’s later theory of the Urphänomene. CH. MÖCKEL, Cassirers “Basisphänomene” – eine Synthese von Goethes “Urphänomenen” und Carnaps “Basis” der Konstitutionssysteme? This paper examines to what extent Ernst Cassirer, in choosing the fundamental term “basis phenomena” – which is of crucial importance to a metaphysical theory able to serve as a foundation for his philosophy of symbolic forms –, is influenced by Goethe’s “primary phenomena” of artistic life-activity and Carnap’s “bases of constitutional systems” for the concepts of empirical sciences, that is, to what extent Cassirer unites both inspirations in his newly coined term. Proofs for both influences considered are presented, sourced from Goethe’s and Carnap’s writings as well as from Cassirer’s. Any doubt about the close relationship of the terms “basis phenomena” and Goethe’s “primary phenomena” is removed, and the connection with Carnap’s concept of different “bases of constitutional systems” is shown to be at least highly probable. Cassirer’s revised version of Kantian apriori forms that we find in his Philosophy of Symbolic Forms, does not seem to be the last stage in his search for principles underlying all the various kinds of cultural forms. In the decade following, the Kantian epistemological terminology, as well as Cassirer’s own symbolic philosophy of culture, is replaced in the new theory of basic phenomena, by a Goethean approach. In this article we deal with the question of what kind of alternative the foundation of culture in basic phenomena is supposed to be, whether it is an “alternative” to his earlier symbolic philosophy at all. In this context we also take a closer look to Cassirer’s criticism of Husserl’s phenomenology as a monadic epistemology. The theory of the expressive phenomenon, formulated in the Phenomenology of Knowledge (1929), is marked by a fundamental unconceptuality; at the basis of the perception of the other it posits the fluidity of the mythical world, or of its correlate. This unconceptuality is destined to a metaphysical or metaphorical outcome. The theory of the perception of expression, formulated in the Logic of the Cultural Sciences (1942), resolves the pregnancy of expression in the fundamental structure of the symbolic world. That the theory of the originary phenomena, I, Thou and Es, formulated in the posthumous work On Basis Phenomena (1940), represents the missing link in the transition from expression to perception of expression, in the translation of the expressive character from the I-Thou relation to the relation with the Es, is possible on the basis of the theory of the work and first of all of the work of art. In his review of Cassirer’s second volume of Philosophie der symbolischen Formen, Heidegger questions whether the account of mythical thought it contains is adequate for an understanding of Dasein. Heidegger’s doubts are based on his claim in Sein und Zeit that a proper phenomenology of Dasein cannot be derived from an examination of the results of the ethnological and cultural sciences. Cassirer later grounds his account of myth as a symbolic form in his analysis of the Ausdrucksphänomen but it is doubtful that Heidegger would have found this adequate. Cassirer is intent on upholding his doctrine of Dasein as objective. In the fourth volume of Philosophie der symbolischen Formen, done from Cassirer’s Nachlass, Cassirer criticizes Heidegger’s Dasein as established by a subjective phenomenology derived from a philosophy that is religious in form. Cassirer holds that Heidegger’s philosophy is not only wrongheaded, it is politically dangerous, for it offers no basis for human freedom that is necessary for moral judgment. We are happy to inform you that the second issue of Cassirer Studies has just come out with the title “Theory of Figuration”. Each contribution brings a new perspective to bear on the studies concerning Cassirer’s three functions Ausdruck, Darstellung, Bedeutung, which still stands as a boundary topic between the Philosophy of Symbolic Forms and the theories of representation in general, as they all tend towards a “theory of figuration” as such.